When speaking about plans for a children's hospital, Michael Jackson said, "That will be remembered more than my performances"
A rambling and slurring Michael Jackson was heard talking about his upcoming concert tour and plans to build a children's hospital on a recording played Wednesday for jurors at the involuntary manslaughter trial of the superstar's personal physician. Jackson, his speech labored and barely intelligible, talked about his love for children and determination to build the hospital after a series of "This Is It" comeback concerts. 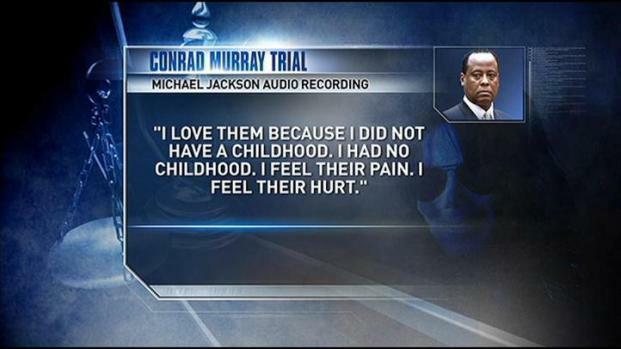 The recording, made about six weeks before the King of Pop's death, was extracted from Dr. Conrad Murray's iPhone. "That will be remembered more than my performances," Jackson said on the recording as family members and the jury listened in court. "My performance will be up there helping my children and always be my dream. I love them. I love them because I didn't have a childhood... I feel their pain. I feel their hurt. I can deal with it." Michael Jackson's slurred voice was once again heard in court. Many vials of drugs were also produced. Part of the recording from May 10, 2009 was presented during the prosecution's opening statements. The prosecution is attempting to show that Murray should have realized, just by listening to his patient speak, that something was wrong. On this recording played Oct. 5, a slurring Michael Jackson can be heard talking about his tour and plans for a children's hospital. "That is what Conrad Murray is seeing and observing," said Deputy District Attorney David Walgren during opening statements. "What does he do? On May 12, he orders another shipment of propofol." The superstar died about six weeks later. A coroner's report cited "acute propofol intoxication." 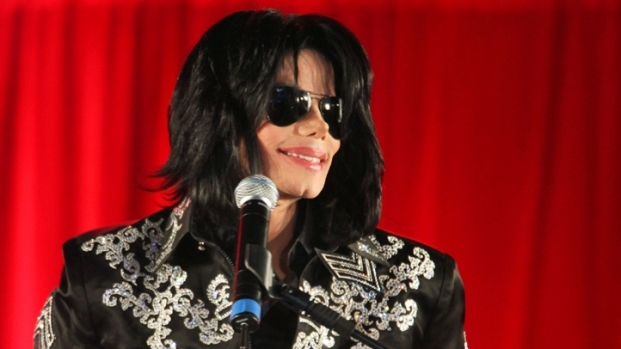 Jurors also heard Jackson describing to Murray his desire to please fans during his upcoming "This Is It" concert series in London. Prosecutors presented compelling audio and visual evidence today, including more of the audio recording from Jackson. Also, a coroner's investigator takes the stand. NBC4's Patrick Healy reports. "We have to be phenomenal,'' Jackson said. "When people leave this show, when people leave my show, I want them to say, 'I've never seen nothing like this in my life. Go. Go. I've never seen nothing like this. Go. Go. Go. It's amazing. He's the greatest entertainer in the world.'" The recording played Wednesday ended with Dr. Murray asking Jackson whether he was ok.
"I am asleep," Jackson responded. The second week of the Conrad Murray trial featured a lot of testimony about the drug Propofol, and how it should be used. In court, the Jackson siblings, Rebbie, Jermaine and Randy, were visibly moved by the recording of their brother. Upon leaving court, they declined to comment. Stephen Marx, the computer forensics examiner who analyzed Murray's phone, took the stand Wednesday morning to talk about what he discovered on the phone. Marx said he also retrieved a voicemail message from Jackson's former manager, Frank Dileo. The message, left five days before Jackson's death, reveals Dileo's concerns about Jackson's health. Elissa Fleak, of the LA County Coroner’s office, took the stand after Marx. 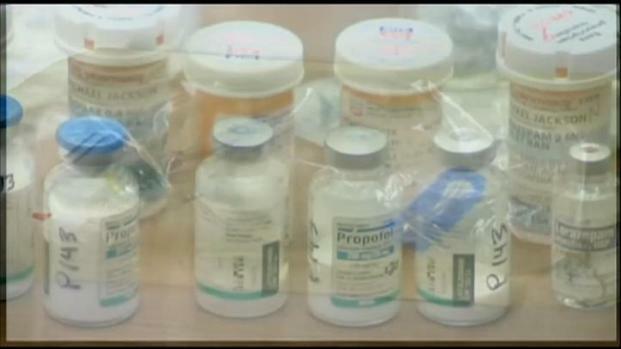 Prosecutors showed Fleak, one by one, dozens of medical supplies and prescription drug bottles prescribed to Michael Jackson. He asked Fleak to confirm that she found each of the items in Jackson's home. "Yes," Fleak answered each time. On Tuesday, prosecutors attempted to show that Conrad Murray was performing a balancing act that involved phone calls to his girlfriend on the day Michael Jackson died. Conrad Murray's girlfriend testified Tuesday -- Day 6 of the trial -- about phone calls she had with Murray on the day Jackson died, one of which occurred as Murray rode with Jackson in an ambulance. Another witness, Sade Anding, testified that she was on the phone with Murray at about the time prosecutors contend the doctor realized Jackson wasn't breathing. Nicole Alvarez, an actress, provided Wednesday's most dramatic testimony. She talked about meeting Michael Jackson, the excitement around his upcoming "This Is It" concerts and shipments she received for Murray at her Santa Monica address. The packages contained the powerful anesthetic propofol, the drug that Murray was administering to Jackson on the day he died. Prosecutors alleged Murray administered propofol, a drug that an emergency room cardiologist earlier testified she had never seen administered outside a hospital setting, to Jackson and then failed to properly monitor his patient. The defense is attempting to show that Jackson administered the fatal dose when Murray left the bedroom.